My whole family loves seafood and I’ve grown up on traditional Kerala and Malabari-style seafood. Masala fried fish, Alleppey red fish curry with tapioca, whole fish steamed in banana leaves, prawn curry with raw mangoes… I could go on and on!! 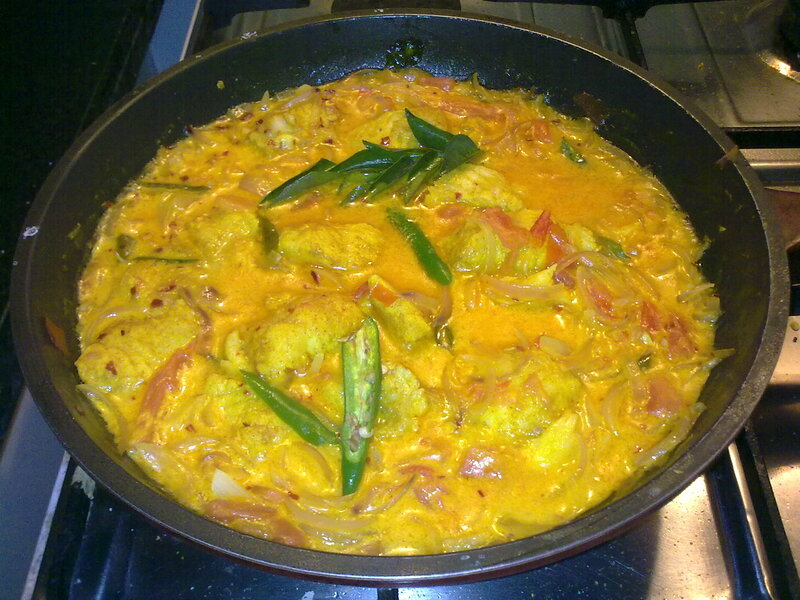 Most Kerala fish curries are spicy, and use a fair amount of chillies and tamarind/raw mangoes for that zing. One of my favourites, though, is the much milder fish moilee. 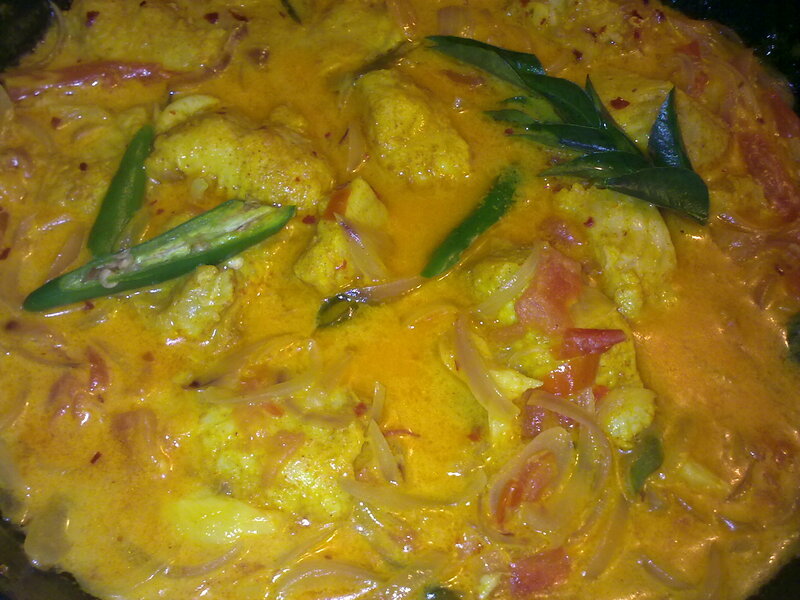 It’s a coconut-milk based fish curry, and goes great with steamed rice or appams. It’s mild, simple, yet full of flavour; and pretty easy to make as well. The other day, I was pretty disgusted when I saw Nigella Lawson massacre what seemed to be a fish moilee on her show. She called it a Keralan Fish Curry, adding the disclaimer that she had never been remotely near Kerala, and trust me, it shows! She marinated the fish in a heap of turmeric, and the recipe also had chillies, garlic, a TON of onions, and some tamarind paste thrown in as an afterthought. The concoction was a vague mash-up of many ingredients that normally would go into a Kerala-style fish curry, but one look at the gloopy orange mess and I wanted to CRYYYY. As you may infer- I am not the biggest fan of Ms Lawson. Anyway, last Sunday the whole family (mom+dad+me) decided to troop into the kitchen and cook. Mom made coconut green beans, dad made prawn masala and I decided to make REAL fish moilee. My dad and I went grocery shopping and picked up some Vietnamese bassa fish fillets, so I decided to use them. It’s a firm, light fish and picks up the flavours of the other ingredients easily. And the coconut milk came from a Dabur tetrapack. A lot of people I know use freeze-dried coconut milk powder, but I prefer the one that comes in a tetrapack/can. I have a weird mental block against the powdered variety- it doesn’t dissolve properly, it leaves lumps and a layer of scum on the top of the curry. I recalled the recipe from memory, since I’ve watched my mom and grandmom cook it when I was a kid. I just follow my instinct and go along. But below is a step-by-step recipe from the Food Network’s website. It’s pretty much how my family makes it. And it’s so easy!! Rinse the diced fish chunks in water. Drain off the excess water and place the fish in a bowl. Add turmeric powder and a large pinch of salt. Add lime juice and mix. Cover and refrigerate for 25 minutes. Heat the oil in a deep saucepan over a medium gas flame until seriously hot, but not burning. Add the chillies, ginger, garlic, onion, and curry leaves to the oil. The curry leaves must be added in at the beginning, so the flavours can infuse with the other ingredients. Stir lightly until onions are transparent. Add 1/2 teaspoon of turmeric powder, and stir. Add enough liquid coconut to cover the ingredients in the pan. Do not add the thick coconut milk yet, as it will curdle. Add the fish and a pinch of salt. Bring to the boil, reduce heat, and simmer for 6 to 7 minutes until cooked. Add the quartered tomato and the thick coconut milk. Garnish with sliced tomatoes and serve with boiled or steamed white rice. HAHAHA! I know the curry she meant it to be, rather sad isn’t it. But my goodness I know people who love it, unreservedly. I didn’t mind too much because, shock, horror, I am not a Fish Moilly fan. Now I am a bit on the fence with Nigella. She is the one that really got me going in the kitchen. Her book How to Eat was magnificent and formed the basis of my entire cooking experience. So for that, I am grateful . But I do find the fluttering eyelashes and sideways glances too much now, particularly those of her recent series. She’s coming out with Nigellissima and I am hoping her natural intelligence will make itself more the dominant presence on screen. One can but hope! Well, for people who can handle spice, moilee can be kind of bland! And I am also on the fence: she does have some great, easy to put together recipes; and I also like her philosophy of express cooking- sometimes it’s ok to packaged stuff, especially if you live someplace where free-range and organic are not that readily available. I just don’t like her moans and descriptive words and the lubriciousness. I should pick up Eat as well. Converting further! Hahaha that little Nigella encounter was priceless. It’s so refreshing when you can’t stand someone that everyone else seems to idolize. Thank yoooou. I started watching her shows because one of my guy friends used to go on and on about how awesome it was. She does make offer quick recipes for busy folks, but the innuendos can get annoying!